If you only had a passing knowledge of the group Bloc Party, you might not necessarily assume them to be particularly dynamic. And even if you have some level of familiarity with the band, it would be understandable if you didn’t automatically label them bombastic. After all, 2005’s blog-critic classic, Silent Alarm (Vice), was almost instantly drowned in the remix treatment, leaving most of the album’s harder sensibilities to get lost amongst an endless supply of glitchy dance-floor bangers. It even ended up more or less seeing re-release under the aptly named Silent Alarm Remixed. And Bloc Party’s recent sophomore return, A Weekend In The City, is similarly misleading, as the album spends much of its time floating through casual dreampop and down-tempo offerings. All of which made it all the more surprising when Bloc Party declared their intent onstage Friday night at the Congress. The band, at this point far past the niche, indie-secret status they once embodied, are seemingly beyond comfortable with their standing and have fully embraced their status as a Stateside sensation. Which made for some of the best moments of the evening. OG Bloc Party hit “Banquet” won the room over universally, and served as a reminder of how far the band have come. And City‘s haunting, effects-laden “Hunting For Witches” demonstrated newer Bloc Party could command attention when it wanted to — as few and far between as those moments were. The attitude seemed to sum up the apparent difference between newer and older Bloc Party material, seemingly traded off in fair amount throughout the night. Perhaps all the fame and NME covers have made Bloc Party a bit softer, as Silent Alarm fare still comes off remarkably more haunted and anxiety-filled than newer, more placid City songs. And while the softer side of Bloc Party delivers some of the best indie pop on the far left side of the radio dial these days, the overall lack of direction and connection were immediate obstacles from the get-go. The upside of the night was that whichever version of Bloc Party you preferred, you were delivered: troubled indie upstarts, or somewhat placated critical darlings; jerking, raucous anthemic U.K. dance-rock, or mellowed dream-pop troubadours. Both were in attendance, and both came out to play. The downside of the evening? 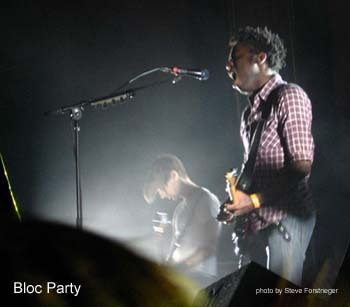 Just as often as not, the two sides of Bloc Party quickly divided the room as often as they did unite it.